Capitol Supermarket was established in April 1976 by a hard working Korean-American family with 3 decades of experience in the grocery business. The company sells a variety of food, including international products. The owners want to revamp their website in order to appeal to new customers and showcase the wide selection of affordable foods an products. A usable and aesthetically appealing online platform. Define users’ motivations, needs, and frustrations when shopping in-store and while browsing the website. Understand what makes a customer’s grocery shopping experience satisfying. Understand industry standards and what features/services/offerings give local grocery stores a competitive edge in Washington, DC. 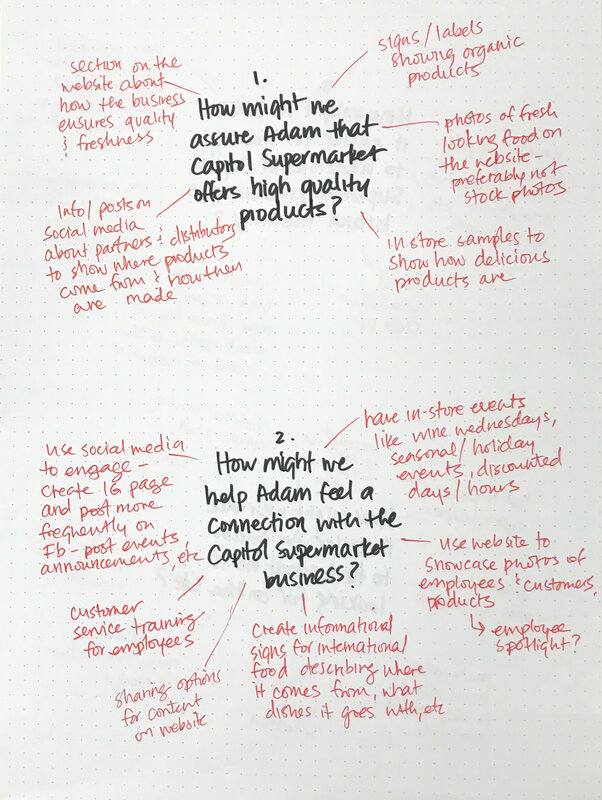 Identify areas of improvement for the Capitol Supermaket website. First, I conducted secondary research to familiarize myself with the national and local grocery landscapes. I collected information from articles and case studies on trends, challenges, and areas for growth to identify industry standards and user expectations. 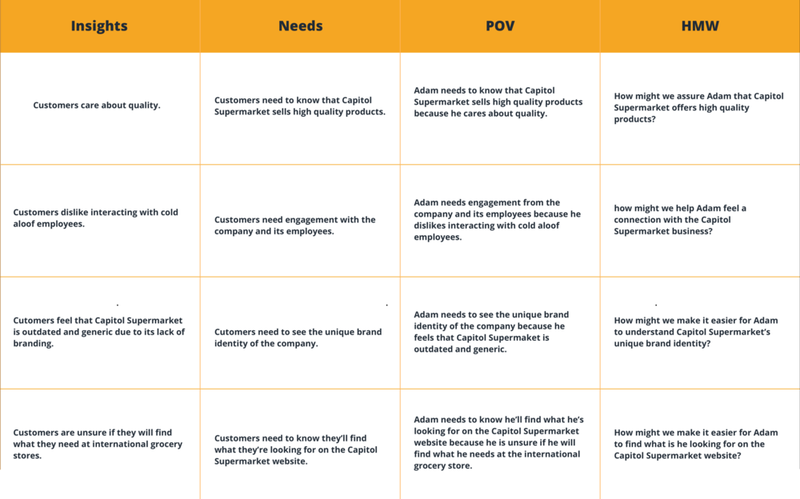 To build off my secondary research, I analyzed some of Capitol Supermarket's competitors in the grocery industry. I uncovered the strengths and weaknesses of the business's direct competitors Streets Market and Union Kitchen Grocery. In addition, I performed a competitive analysis on Yes! Organic Market and H-Mart which are indirect competitors of Mirror. Brand identity goes a long way in separating small grocery stores that sell similar things. Union Kitchen Grocery and Yes Market have similar products but one has a reputation for being more inclusive even though the prices are just as high. Brand identity will be crucial to revamping Capitol Supermarket and diversifying its customer base. Empathizing with the target audience is a crucial step in the design thinking process, so it was essential to go out in the field and interact with real customers. I spent a day at Capitol Supermarket chatting with customers about their motivations, needs, and frustrations while shopping there and other grocery stores in the area. Customers expect e-commerce options on a grocery store website. Customers care about the values of the store and its owners. Affordability and quality are the most important factors for residents when choosing where to buy groceries. Customers live primarily in the same neighborhood as Capitol Supermarket. Customers choose Capitol Supermarket for its affordability and convenience. Customers need to know that Capitol Supermarket sells high quality products. Customers need engagement with the company and its employees. 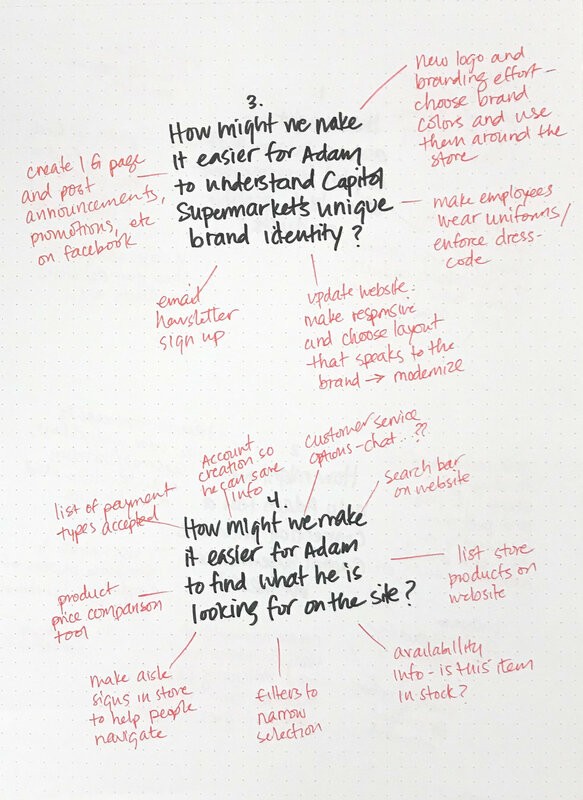 Customers need to see the unique identity and brand of the company. Customers need to know they’ll find what they’re looking for on the Capitol Supermarket website. Next, I used all of the qualitative data i gathered during the research process to create Adam, my persona. Adam spent his childhood living in many countries and cultivated a passion for cooking international cuisines. He seeks to find the freshest authentic ingredients he can for his dishes. Finally, I sat down and brainstormed as many solutions as possible to the HMW questions I had developed. Now that I had empathized with target users and identified their needs, I needed to define the solution. I reflected on the business goals, user goals, and technical considerations to find a happy medium for all stakeholders. Once I had identified common areas, I could decide what product features were necessary for the prototype. I began the process of wireframing with sketches of variations of the website landing page. 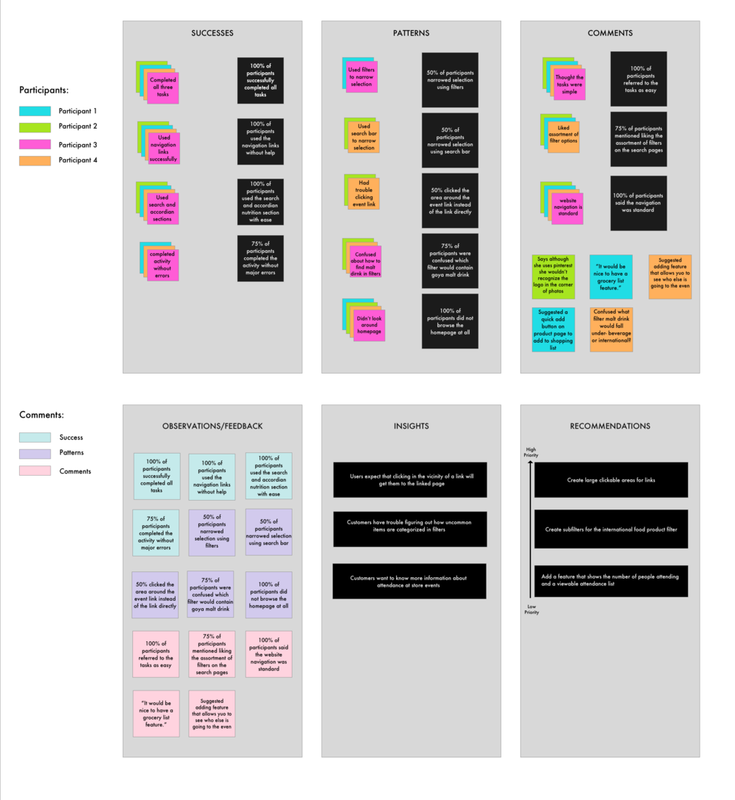 During this process, I thought about how the layout and content could be structured to satisfy user and business goals in a technically feasible way. The sketch I chose served as a guide for my digital wireframes. At this point in the design process, I needed to think about how I wanted the site to look on different screen sizes. It was essential that the website would present as well on tablet and mobile devices as it did in desktop size. I created responsive wireframes for Capitol Supermarket's key pages and began to flesh them out. I asked 4 participants to test out the prototype's usability. The participant pool was comprised of people between the ages of 18 and 65. Two participants met me in person to complete the usability test, while two others did so remotely via Skype. The participants were given three different scenarios, each with a task to complete. View the page for the upcoming wine tasting event and confirm your attendance. View a recipe, and navigate to the nutritional facts section. head to the Goya Malt drink product page, and see if Capitol Supermarket has them in stock. Overall, users navigated through the website without difficulty. 100% of users referred to the tasks as either simple or easy. Confusion most often stemmed from issues choosing filters for uncommon products or technical issues with the InVision app. More usability tests will have to be conducted on other site features such as the reviews section placement and the grocery list feature once it’s complete. Create sub-filters for the international product filter. Create large clickable areas of links on the prototyep. Add a feature that shows the number of people attending and a viewable attendance list. At this point in the process, i began thinking about how the website would look and feel to visitors. I came up with a series of descriptive words that captured the essence of the Capitol Supermarket brand: lush, modern, colorful. With these adjectives in mind, I created mood boards on Pinterest where I collected pins of typography, logos, and color schemes that aligned with my vision for Capitol Supermarket. I began brainstorming ideas for a logo, aided by the inspiration I found on Pinterest. I wanted to maintain some elements of the current logo in a way that projected a more current, professional image. The result was a new logo image of the Capitol Building-a simplified, more contemporary version . The image was changed to green, a color that evokes thoughts of freshness and positivity. I applied the branding to my mid-fidelity wireframes. With all of the visual details added, the were fully fleshed out. While the usability test feedback was mostly positive, the prototype is not perfect. I plan on fleshing out the rest of the pages of the prototype, especially the shopping cart and filter features. I plan to continue the iterative cycle of testing and updating the prototype. I will use Zeplin to hand off the design to the developer team when I have made all improvements to the prototype.